This is WAY overdue, but I'm FINALLY posting about PLA2016! 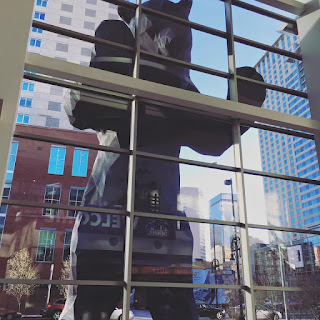 Last month I returned from my first national library conference, PLA in Denver, CO! I have written up my notes and semi digested what I have learned, naturally it is time to regurgitate and blog about it, but first, Big Bear at the convention center! From the sessions I attended I kept writing down buzzwords and themes associated with what I deemed were the major themes of PLA. Once I got home I doodled these buzzwords on my notebook. Engagement was the one I heard the most, repeated in nearly every session. I believe our profession has figured out that we CANNOT hole up in our buildings and wait for people to show up. We MUST go to where the people are in our communities, we MUST talk to people and figure out what is important to them and what their needs and wants are, instead of assuming these things, this is how we will survive into the future. I am presenting a talk to my fellow co-workers next week about my experiences at PLA. If you're interested in my in-depth experience or about the sessions I attended, please check out my powerpoint presentation below.